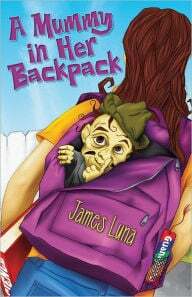 In the classic tradition of The Gingerbread Man, James Luna’s piggy cookie leaps off the baking tray and takes the reader on a mad dash through the barrio. The telephone repairman, the bus driver … each person the piggy encounters is greeted by his laugh and the repeated refrain: “Chase me! Chase me down the street! But this is one piggy you won’t get to eat! I ran away from the others and I’ll run away from you!” The cochinito fugitivo avoids being eaten by the long line of people chasing him through the neighborhood streets … until he meets a crafty little girl named Rosa! Children—and adults too—will delight in the clever piggy’s escape from Martha’s Panadería in this entertaining re-telling of a familiar story set in a colorful Latino neighborhood. A recipe to make Mexican gingerbread pig cookies is included in both English and Spanish. Flor enjoyed her two-week trip to Mexico, though she’s glad to be back at school. But when she tries to pull her homework out of her backpack, she’s shocked to feel a cold hand clutching hers. She’s even more stunned when she sees two yellow eyes peeking out at her. Flor and her best friend Lupita stare in astonishment as a cowboy hat, followed by a small man with dark yellow skin and thin, stringy hair, emerges from her backpack. He introduces himself as Rafa, a mummy from the famous museum in Guanajuato. She can’t believe that an actual mummy hitched a ride with her to the United States! A new picture book to debut in 2018.